I find your arguments pretty unconvincing. I think you severely overestimate the magnitude of this negative feedback. Why? Apart from the fact that your claim goes against current climate science it goes against pretty much everything we know about past climates too. Just have a look at Shakun etal (2012) and how the transition to our current interglacial worked. Skeptical Science has a nice write up of the paper. 2) "This Arctic warming melted large quantities of ice, causing fresh water to flood into the oceans." 3)" This influx of fresh water then disrupted the Atlantic meridional overturning circulation (AMOC), in turn causing a seesawing of heat between the hemispheres." 4) "The Southern Hemisphere and its oceans warmed first, starting about 18,000 years ago." 5)"The warming Southern Ocean then released CO2 into the atmosphere starting around 17,500 years ago, which in turn caused the entire planet to warm via the increased greenhouse effect." Evidently we didn't turn back into a new Ice age - due to a year-round snow cover nor sth. else - back then (see second figure), when the CO2 concentration was at around 220 ppm. Why on earth should we tumble into an ice age now (or get a snow cover that lasts through the summers ), when we have 400 ppm CO2 in the air? Yes, the fresh water influx will - or already does - disrupt the AMOC (see point 3 above and Hansen) and it will give us a very rough ride to where we headed. ... Evidence from Lake El’gygytgyn, NE Arctic Russia, shows that 3.6-3.4 million years ago, summer temperatures were ~8°C warmer than today when pCO 2 was ~400 ppm. To sum it up: No, snow cover will not survive the summer in the years to come & no Ice Age is cometh. That gives me another idea for an interesting bit of analysis. The wintertime average zero degree isotherm is presumably marching northwards. But how fast? I think the research you presents has some valid points but 1) I do not believe that model-simulated biomes can be verified with any sort of comprehensive accuracy, especially at a grid scale of 50KM, and 2) I think the key point you are missing in my argument (and in yours) is that at all stages of ^ post, the Earth *has* been in an ice age, and continues to exist in an ice age. Just because the Laurentide has almost disappeared does not mean we are not in an ice age; we still have Greenland and Antarctica, which contain vast amounts of ice that would not exist if we were not still in an ice age. I believe it has been established that at the height of the last glacial maximum, the Arctic Ocean was ice-covered; my big question is what was the Arctic Ocean's state at the *start* of the last glacial maximum? This is a question I have not been able to answer and I suspect the answer is ice-free. I also suspect that the more heat the Arctic accumulates/the longer it remains ice-free in the context of the ongoing ice age, the *more* glaciation occurs after it hits this state (i.e., the heat influx continues until the continents/ice sheets can sufficiently overwhelm the mechanism through both albedo and freshwater feedbacks). Globally the temperature may not lower, but regionally, as Hansen's charts and maps show, it is already beginning to happen in certain spots and is likely to become more prominent as AMOC shutdown continues. More importantly, as the linked study re: glaciers in Sweden shows, it seems that high-altitude regions in Sweden (and likely elsewhere) merely need 100-150% of past snowcover averages to achieve a snowpack that does indeed last for the summer, even if temperatures remain steady. I believe that combining the imminent temperature trends projected by Hansen with the increasing moisture resulting from an ice-free Arctic shows the above to be more than plausible, and if that is the case, we can see a clear mechanism for reglaciation that does not rely on model-ology and paleoclimate simulations. Finally, not to post too many times, I have been reading into the "Karakorum anomaly". This stabilization and increase in ice mass across the Western Himalayas and Karakorum range only began in approximately 1995-2000, with a steady trend towards growth continuing since then. 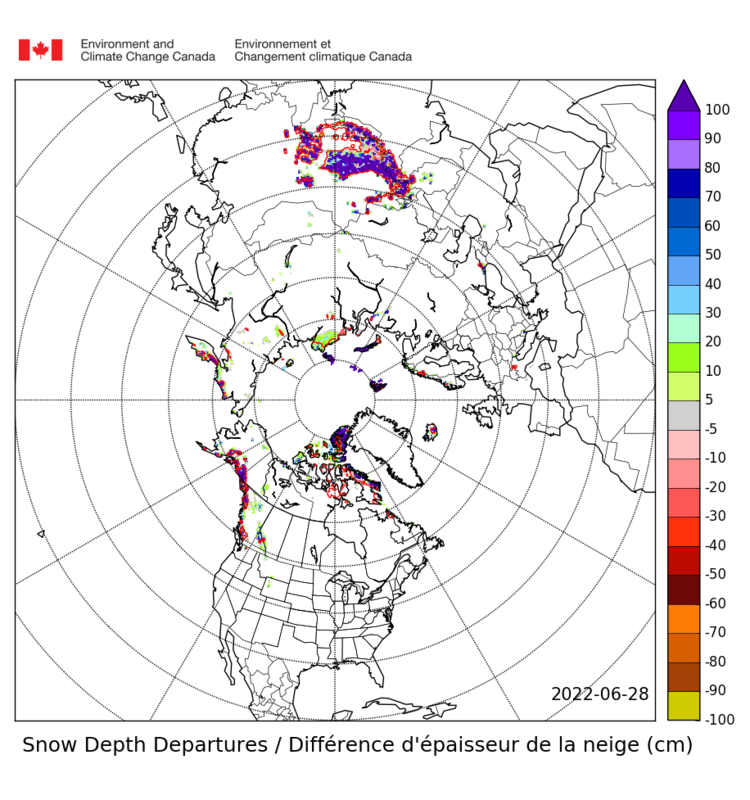 While data is still sparse for 2011+ I suspect that those snow maps from the Canadian ice service are indeed accurate as they corroborate the recent trends in the region. In the face of overwhelming melt, we must look at examples like the Karakorum, which run completely contrary to past notions of what would happen, and ask: why is this occurring? I would postulate that the impact of additional water vapor (and consequent glacial advance) manifests earlier in the highest altitudes of the Northern Hemisphere, and slowly begins advancing downward in elevation (similar to the ideas put forth by johnm23). The relatively slight warming we have seen in these regions has now seemingly reversed as snowcover has become more impressive on a year-round basis. I suspect that over the next ten years we will see this continue across the Karakorum and Western Himalayas while also witnessing similar reversals in trendlines in areas even further down in elevation, like the peaks of the Rockies, Alps, and mountains of Southwest Asia. So far any positive anomalies have seemingly been restricted to altitudes of 5KM+, but as the other moisture feedbacks continue to accelerate (i.e., ++snowcover), they will begin to occur in many other regions as well. It is important to note that the above does ***NOT*** discount overall global warming or anthropogenic climate change, and would also seem to directly refute the notion presented by several posters & papers in this thread that CO2 is the end-all. Of course CO2 is very important, but I believe (and the crux of my argument has been) that albedo feedbacks are even more crucial. I would compare CO2 + albedo to a match with a tub of gasoline; on its own, the gasoline is whatever, but when you add fire, boom. "...which run completely contrary to past notions of what would happen..."
I think that, once again, you aren't representing the science accurately here. No serious scientist ever suggested that we have perfect knowledge of what would happen in every location at every point. And I have read fairly often of expectations that some glaciers and areas are likely to experience increases in snow and ice for a while. There is, after all, what, some 7% more water vapor in the atmosphere. That's got to come down somewhere. And where it's cold enough, it will come down as snow. Saying that this increase in this area is "completely contrary to past notions" is like saying that the increased snowfall in New England in the last couple years is somehow contrary to climate models. And again, no, increased snowfall in a couple of specific regions in no way shows that "...albedo feedbacks are even more crucial [than CO2 forcing]..."
Increased water vapor is an expected consequence of increased CO2 driven warming, and it has always been assumed that in certain locations that this will mean more snow fall. You seem perfectly willing to pretty much completely ignore the many cogent points made counter to your main claim, so I will endeavor to (not) respond in kind going forward. Best of luck in an uncertain world. "my big question is what was the Arctic Ocean's state at the *start* of the last glacial maximum? This is a question I have not been able to answer and I suspect the answer is ice-free. " My gut feeling on this is that Albedo has been the climate change driver from 1700-ish on. GHGs are just now catching up in importance. More show fall means more light reflected back to space and more IR radiated to space. But there is a thread on albedo warming potential. In that thread the comment was made that snow early has less effect than snow late does. That is as it relates to Arctic sea ice loss. I could see that being possible/likely. But I would actually go back farther than 1700 in terms of GHGs/albedo impact. Not in weighing one more than the other, but in re-thinking our current knowledge of what caused the changes to the earth's climate. I do not think it is coincidental that the Little Ice Age followed the largest period of human death in our species' history. This period followed three main events; the Mongol conquest and killing of much of Asia, the Black Death, and the discovery of the Americas with the consequent genocide of ~100 million people in that episode alone. Combined, I think we can clearly see that depopulation was a major driver (or was likely a major driver) of the Little Ice Age. This was probably not just due to a reduction in GHG emissions; the changes to continental albedo must also have been fairly dramatic, and an ensuing uptick in forested areas (although relatively short term) would have also provided a massive carbon sink. Think of all the fields/etc that went fallow & sprouted trees after the people who had tended them for several centuries died of plague, Mongols, or smallpox. That is probably at least several percentage points of Earth's total land mass! Traveling back further in time, the "Medieval Warm Period" followed the advances and innovations of both Rome and China, which also coincided with the population peak ~1250. And while we like to think of modern humans as some kind of exceptional race, we are anything but -- and this "exceptionalism" also applies to our preconceived notions re: GHGs and the Industrial Revolution (in that, 99.9999% of people believe that GHGs only became significant following the IR). This is far from true. In fact, papers show that total atmospheric copper emissions from the Romans and Chinese were hugely impressive, and it would take until approximately 1850-1900 for modern emissions to equal that which was put out between 1,500-2,000 years ago! Techniques for industry were dirtier by orders of magnitude compared to today's processes, so even though they may have used less resources than we do today, their processes for extracting and refining were evidently adequate enough to rival the societies of ~1900 Europe in their total emissive capacities. Going back even further, I suspect that while Milankovitch cycles may have been the primary climate driver pre-humans, early agriculture & late hunter-gatherer societies were equally transformative, and were the point at which humans overwhelmed the global system. The changes to planetary albedo began with the destruction of megafauna, and culminated with the advent of agriculture, both of which affected decent percentages of the planetary land surface despite very low human populations. Somewhat of a digression, but I find the subject of pre-IR human-induced climate change extremely interesting, and when you consider the historical evidence/coincidences between the planet's climate and human society, it seems that the latter has led the former, and not vice versa. Look up the Ruddiman hypothesis. He argues that forest regrowth lead to a reduction in carbon dioxide concentrations and thus cooling. My understanding is that, in albedo terms, forests are darker than farmland, and so would cause warming, rather than cooling, were it not for the carbon dioxide effect. <Snip>My gut feeling on this is that Albedo has been the climate change driver from 1700-ish on. GHGs are just now catching up in importance. I'm confused. Why not look up the numbers on albedo change as opposed to greenhouse gases rather than rely on your gut feeling? That sound about right. Also forests affect the local hydrological cy le and and cloud formation with an additional cooling effect. Wanted to bump this... as this seems to be the first year since the mid-80s with the exception of 95 or 96 that May has seen a glaringly positive snowfall anomaly. The departure was larger in Eurasia than North America though both saw positive anomalies... I would chalk this up to the Himalayas having more area than the Rockies + the very staunch endurance of the Siberian pack. But more importantly: does this confirm that even with all the heat energy we've accumulated, that we *could* indeed see a snowball effect given increasing open water near the North Pole, and corresponding moisture feedbacks? The rhetoric around opposition to my arguments for this potential focused on the recent lack of spring snowcover... which 2017 proved is *not* an absolute, even with temps at the warmest levels they have ever been (or very close). Beyond the Rutgers graphs, snowcover anomalies continue to be impressive as we approach the solstice. Per the Canadian maps we are over +1SD in extent still, and per the Finnish volume graph, we are... well... above and beyond what any year has seen previously at this time. It is important to note that although the relative % of the NHEM that is snowcovered is still quite low, compared to normal it is, if the Finnish graph is to be believed, many many standard deviations removed from normal. 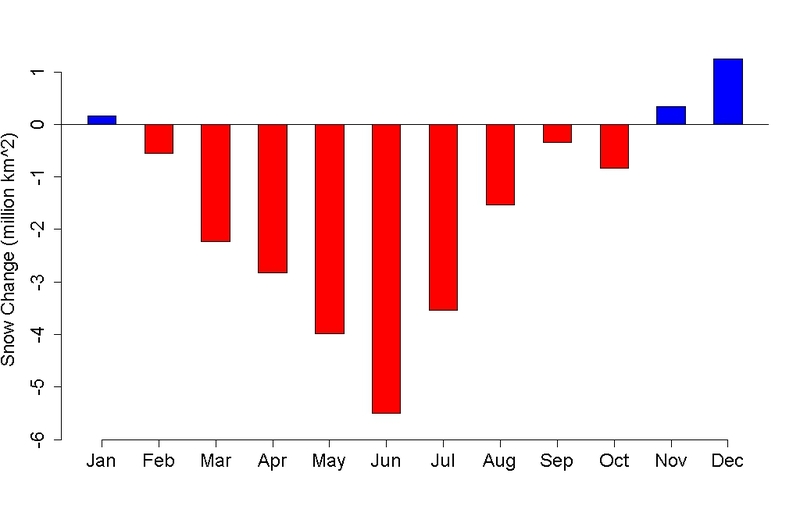 I would argue that given June insolation's far greater values than January's, the impact of this residual/in some areas still-growing snowpack is greater now than at any point in the winter. The question is whether this will allow the Arctic to retain some integrity this year, and on that point, I think the answer is no, which begs the question of how low the volume goes this year (both for ice and snowcover), and subsequently, whether 2018 continues the rather extraordinary bucking of the decadel trends we have seen this year. I would posit that the enduring anomalies in the Himalayas will outlast Siberia and may even survive the summer, setting up explosive fall growth for the NHEM as we see 1) an extraordinary amount of mountaintop snowcover survive the NHEM summer, and 2) record low sea ice volume as we enter the fall months. The Himalayan anomalies could also further the deterioration of the Arctic as we see the Siberian anomalies continue to erode (and unlike the Himalayas, parts of which continue to see massive snowfalls, snow is mostly finished/only falling in relatively token amounts along the Siberian coast). As Siberia loses its snowpack, I suspect that the jet stream will be able to waft enormous amounts of heat up and over the Himalayas (with the snowpack there encouraging +500MB height anomalies to the north), and that air is going to head directly into the heart of the Arctic. Time to re-examine your priors. You seem to be stuck in a loop of self-delusion. Very little of your last post makes any sense, very little is factually correct, and the conclusions you have drawn are unsurprisingly detached from current reality as the rest of us experience it. "The first principle is that you must not fool yourself—and you are the easiest person to fool." You have fooled yourself. That is plain to see. Until you see it yourself, there is no hope. ...recent lack of spring snowcover... which 2017 proved is *not* an absolute, even with temps at the warmest levels they have ever been (or very close). May snow cover was indeed anomalously high compared to recent years, but temperatures were NOT at the "warmest levels" ever. Not even close. May 2017 was the 2nd COLDEST in the last 15 years north of 60degN. The jetstream flowing away from the Himalayas heads towards Japan and the Pacific Ocean, almost never towards the Arctic. Now the positive feedbacks will kick in. Will the Siberian and Canadian tundra warm faster due to the extra insulation of thicker winter snow cover? I regret to inform you all but the intensification of the NH jet stream associated with the heavy snow pack over N Eurasia was associated with decreased trade winds over the eastern tropical and subtropical north Atlantic. Atlantic water temperatures have surged above normal from the coast of western to the coasts of Spain and Norway. The warming off of N Europe is associated with the strong jet stream troughing southeast of Greenland associated with the strong westerlies and strong temperature gradient southeast of Greenland. We are going to soon see a positive feedback from positive water vapor anomalies. 3) I add a third effect to sea level and other land-based effects to these effects. Once there are no sea ice floes left at the Central Arctic Basin, the sea ice growth no longer advances from the North Pole to the South (towards the ocean's perimeter). Now the re-freeze must progress inversely from the perimeter in the south towards the North Pole at the centre of the ocean. This inversion of the direction in spreading of the sea ice's margin growth leads to 4-8 weeks' delay. (A) re-freezing must wait until the coastal margin reaches the freezing point (sea ice leads currently begin to cool down from 25th July onwards at CAB and are the first area to freeze) - for the coastal margins to reach the point, a delay is up to two months (positive methane feedback). (B) the churning of the ocean keeps waters in the Central Arctic and the North Pole increasingly open even in midwinter due to the open waters there mixing vertically. In addition, the growing temperature gradients between a stubbornly-warm ocean center in winter and the rapidly cooling continental landmasses in wintertime (around its perimeter) cause wind and wave actions. The waves break the ice and the winds then will push broken ice towards the Atlantic Ocean and the shorelines where newly formed ice accumulates along seasides. The center remains open and releases heat and snow storms: the Ewing-Dunne 'Lake Snow Effect' of the Arctic Ocean. (The 1950's idea of Maurice Ewing and William Donn that the Ice Ages were caused by the ice-free Arctic Ocean acts like snow cannon to accumulate so much precipitation that it could not possibly melt away during the subsequent short summers of high latitudes.) Even temporary ice shelves may be produced along the shorelines by intense storms piling up sea ice i.e. along the Ellesmere Island and the Queen Elizabeth Islands, topped up with massive snowfalls. In other words (B) the Central Arctic winter hole will form that delay the onset of sea ice formation and makes it much thinner and volatile for breaking - hence further lowering of the spatial viscosity of the Arctic Sea ice. The warmer and wetter winters bode badly for methane clathrates and methane which can escape from the ocean unhindered by sea ice layer. The simple fact is that a warmer world results in an increased moisture load across the planet. Yes, this is contributing to a trend of increased snowfall in the northern hemisphere, something I would expect to continue. Thank you for this link to the "Discovery of Global Warming" website. A very good read. A decades long trend in Chicago as more and more precipitation is rain and the snow that does fall melts out in a matter of days. If you like the website, you should consider buying and reading Weart's book. That's what truly convinced me that AGW isn't a hoax. VAK, one thing is bothering me with what you wrote. Once there are no sea ice floes left at the Central Arctic Basin, the sea ice growth no longer advances from the North Pole to the South (towards the ocean's perimeter). Now the re-freeze must progress inversely from the perimeter in the south towards the North Pole at the centre of the ocean. Do we know this for sure? Surely at a low enough temps the sea surface will freeze. Admittedly open water impede the drop in temps, but still what you wrote seems more like an assumption rather than a substantiated claim. The fact that sea ice typically grows from other sea ice doesn't mean it can't do that spontaneously as well. That kind of difference in insolation makes it very likely that ice (post September) will simply start from the highest latitude and grow towards lower latitude. which suggests that land snow cover is lost in summer much more than it is gained in winter. The net change estimated as the difference of the beginning and ending values of the trend line is about 880 TW. If spread over the entire surface of the earth, and if the difference in TOA albedo between snow/ice-covered and uncovered regions is 0.2, this accounts for a total climate forcing of about 0.34 W/m^2. There you have it. Ice and snow loss imposes a 'positive' feedback on the planet's temperature, to the amount of some 0.34 W/m^2. I have yet to see an example of sea ice growing out of nothing in the middle of the ocean. What I have observed in the many graphs shared here is that ice grows from ice. I have never seen an example of ice growing out of nothing in the open oceans in those graphs. I understand that would be a very difficult observation to make because for most of the record N80 was mostly ice. Maybe someone has data on that? I'm not saying ice can not grow out of nothing out in the ocean, but temperature, salinity and wave action must reach some sort of equilibrium for it to happen. Based on these assumptions I find it unreasonable to think equilibrium will be reached in September. I wouldn't be surprised it took weeks or months before it can get cold enough to form "first ice". After that, I imagine it will grow faster than ever, but too late to even close the Bering. Then next melt season comes around and it is is all thin, salty, first year ice. The Arctic has a BOE even earlier than before, accumulating more sunlight for longer, further delaying the formation of first ice. I have no doubt Tamino is correct. Those of us who have lived their entire lives in Chicago and old enough to remember will recall the brutally cold winters of the 60's, 70's and 80's. We would often get massive, late fall and/or early winter snowfalls, followed by long periods of brutally cold weather with night time temps plunging to as low as -20F. Snow would often remain on the ground for 3 straight months. This has not happened for decades and we have actually gone winters with the temps never falling below 0F. The snow is required for the cold temps to persist as they reinforce each other. Now, when we receive a heavy snowfall and we have a couple of times in the past 6 years (15 inches or more), it melts in a matter of days. When I think about this, I begin to appreciate the frightening tipping point we have reached. An ice free Arctic, even seasonally, will forever alter NH climate and there is no way to go back. I'm East, and a little North of the Windy City near Toronto Canada, and the observable change here is that our local river very seldom freezes now, where in the past the spring breakup was celebrated as a major annual celebration. Initially I had worried that Canada would suffer from a lack of fresh water as snow packs shrank. I hadn't taken increasing precipitation due to increasing evaporation from increasingly warm open water into account. I now feel that floods will do more damage than drought as warmer SSTs feed warmer air that advects south through the damaged polar vortex. A near BOE will cause huge increases in snowfall on nearby land. While the snow will melt away much earlier than in the past, the additional volume will more than compensate for the early melt. New ice can form in several different ways. When water is surrounded by ice packs, as has been common in the Arctic, areas of open water are small and there is little chance for wind to work up vigorous waves. In such calm conditions, ice forms in unbroken sheets called 'nilas'. But now the Arctic has larger areas of open water, and more waves. "As soon as you introduce swell, you get an entirely different form of ice," says Jeremy Wilkinson of the Scottish Association for Marine Science in Oban, UK. Under these conditions, globs of ice crystals tossed about in the water combine to form first a soupy mixture called 'grease ice', and then 'pancakes' of thin ice a metre or two in diameter. Thanks for the link TB. To be me more specific, my concern is that without ice nearby, both the formation of frazil ice and its growth and evolution to more advanced stages will be significantly delayed. The team used a wave tank 30 metres long and 1.5 metres deep at the Arctic Environmental Test Basin in Hamburg, Germany, to test ice formation in calm conditions compared with choppy water and storms1. The team could not replicate the metre-high waves that might be seen in the ocean, so to mimic stormy conditions they increased the frequency of waves tens of centimetres high. Although I admire their effort and creativity, one hundred 1 centimeter high waves are not the same thing as one 1 meter wave. I think ice formation in September in the middle of a BOE is unlikely. Maybe when the sun is gone for long enough, snow might lower salinity and stop the momentum of the waves for long enough for significant ice to accumulate in the center. But it will be significantly delayed and starting from 0, not from 4 million. a ten minute YouTube showing dense (most of the footage) to sparse (around minute 3-4) pancakes and ice-free ( briefly, around 4:20) with some white caps. This footage was obtained in the Arctic Ocean (75 deg N, 150 deg W) on October 29, 2016. Only the long wavelengths are able to propagate through pancake ice. The collisions make floes round, such that they resemble pancakes. Because the pancakes are typically 1 meter or less in diameter, they are below the resolution of most satellite imagery. This means that they are observed only from nearby, from ships or airplanes, or by autonomous platforms with cameras. Pancake ice is relatively ubiquitous in the Antarctic sea marginal ice zone, but it has rarely been observed in the Beaufort and Chukchi seas. However, it was the dominant newly formed ice type that we encountered during this field campaign. We observed pancake ice with far greater regularity during this field campaign than in recent early autumn cruises in the eastern Beaufort conducted through the Joint Ocean Ice Study/Beaufort Gyre Exploration Project. Clearly, the presence of pancake ice shows that wind events and the surface waves that come with them are important to the autumn ice recovery in the western Arctic Ocean. Wind and wave actions are perhaps also linked to the known trend of younger, thinner ice throughout the seasonal cycle [e.g., Maslanik et al., 2011]. The prevalence of pancake ice has a large-scale effect on the autumn recovery of sea ice in the Beaufort and Chukchi seas. Figure 3 shows three maps of sea ice over 1 month; the daily progression is even more complex. As the wave motion declined (either in time or space), the pancakes often rafted together and thereby formed larger, thicker sea ice floes. The pancakes then consolidated (or “cemented”) into surface sheets that were rougher than nilas sheets; these sheets of pancake ice aggregates presumably survived and became the winter ice pack. Sometimes, the pancakes’ dampening of the wave energy appeared to accelerate this cementing process, which eventually protected the interior pancakes from wave motions and allowed the larger floes to form. In some other events, however, strong wind- and wave-driven mixing of ocean heat prevented the ice edge from advancing, and the pancakes melted in place. Thus, the ice edge advanced one week, retreated the next, and eventually advanced again in an irregular pattern driven by the regional storm cycles. This is already off topic, but the nice links Tor posted deserve a response. First the video. Freaking awesome. Thanks, I was mesmerized by it. But the location is right by the ice edge as can be seen in nullschool. The proximity to the ice edge gives this area some distinct advantages over open ocean areas. First, the air is flowing close to ice that means dryer and colder air is close by. Second having the ice pack so near help dampen the waves, allowing bigger chunks to accumulate. This second link is even better because it had great information and it was very well written. But it suffers from the same problem as the video. Their whole study was near the ice edge. They were studying how ice grows when there is an ice sheet a few miles away. That is necessary research and I'm glad we got people on it but it does not apply to a BOE. Maybe as these people finish crunching the numbers they find the answer I'm looking for. Thanks for your efforts Tor, but to me it remains an assumption that ice will grow in September the year of the first BOE. I believe that if it grows at all from the ocean it will start growing very late, and instead of starting from 4 million km2 it will start from 0.